Appropriately nicknamed the “voice of UNC Charlotte,” Chris Garcia is responsible for this recorded message that greets the thousands of Niner Central customers who call each week. Garcia is the associate director for customer experience and communications in Niner Central, an Enrollment Management resource. She specifically manages complex issues from student and family inquiries; ensures communications are current for phone recordings during University emergencies, inclement weather or such related issues; and manages communication updates for other campus partners that utilize Niner Central’s communication resources for temporary relief. Though it launched in November 2017, Niner Central officially moved into its new space in the Cone University Center in March 2018. The full-service contact center incorporates phone, email and face-to-face communication to support student success and retention. The 23 team members provide solutions to both students and families regarding various University services including financial aid, student accounts, registration and records. Born in Pennsylvania, Garcia moved to Charlotte when she was 3 years old. After growing up in the Queen City, she studied nursing at Central Piedmont Community College. 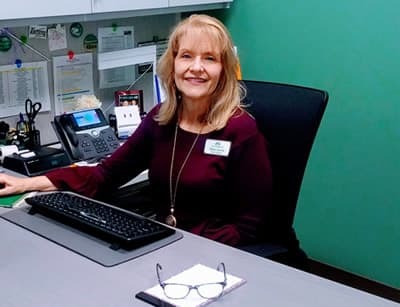 She soon realized, however, she didn’t want to spend her life in that profession and started a job at the State Employees Credit Union, where she worked for 12 years as a supervisor. During her time at the credit union, Garcia worked at a branch that was on UNC Charlotte’s campus. It didn’t take long for her to be inspired by the University’s atmosphere and culture and to realize that this was something she wanted to be part of. In March 1990, she joined the Financial Aid Department and became part of the great Niner Nation. In 2017, Garcia acquired her current role as an associate director where she continues to excel. Because of her role in these students’ education experience, Garcia received a student-nominated award from Chancellor Dubois. Looking forward, Garcia wants to continue building her career in customer service and student services. In fact, Laney often refers to Garcia as “the magician” because she consistently creates solutions to aid students and their families that previously did not exist. When she isn’t working, Garcia enjoys antiquing and taking weekend vacations with her husband of four years, Gordon Molenaar. Garcia also has two daughters, Katie Garcia and Emily Kuykendall. Emily married recently, and helping plan the wedding became one of Garcia’s most rewarding hobbies during the past year. Katie works as a senior hair stylist at Ulta in Mooresville. Inside UNC Charlotte is produced and maintained by the Office of University Communications; campus communicators, who include individuals representing academic and administrative units across the institution, also provide content. Faculty and staff members can submit news, event information or story/video ideas for consideration via the online form (Contact Us) or email insideuncc@uncc.edu.